Here's the fantastic cover for Stewart Bint's forthcoming new book ; Thunderlands. Bint Novel Included in CQ International Magazine's 2018 "Must Read Books"
Stewart Bint's 2015 novel, In Shadows Waiting (republished in 2016 by Dragon Moon Press), is included in the prestigious CQ International Magazine's 2018 list of "Must Read Books." Details are on pages 66 / 67, but do check out all the great books recommended. For the last five years Stewart Bint has written his Up Close And Personal column in The Flyer Magazine -- even publishing two compilation e-books of them. Now, however, the column has a new home. From October, Up Close and Personal will be appearing in The Big Red Magazine. Stewart Bint will continue to post links to the column on his Twitter account and Facebook page. 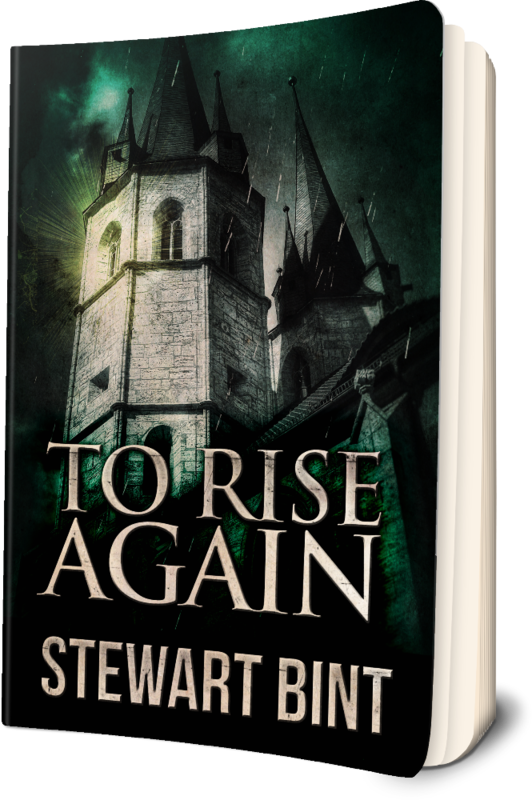 Stewart Bint's latest novel, To Rise Again, was published on September 7th, and is available from Amazon in paperback and for Kindles, here. Now, it's the summer of 1983, and the once-opulent Idlewild mansion is crumbling and derelict. The mansion holds a mysterious lure for 18-year-old David Simeon, who dreams of Idlewild years past, as it used to be. But who is the young girl he sees, endlessly wandering through its corridors? Fantasy, science fiction, horror and paranormal mingle in Stewart Bint's To Rise Again, as the threads of 1945 and 1983 slowly intertwine to reveal a world on the brink of destruction. Hold the front page! Novelist Stewart Bint has just been interviewed by a hamster. Yes, that's right, a hamster. Hamster McKenzie is making quite a name for himself as a blogging hamster from Bristol. So Stewart Bint was highly honoured when Hammy asked him if he'd agree to an interview. 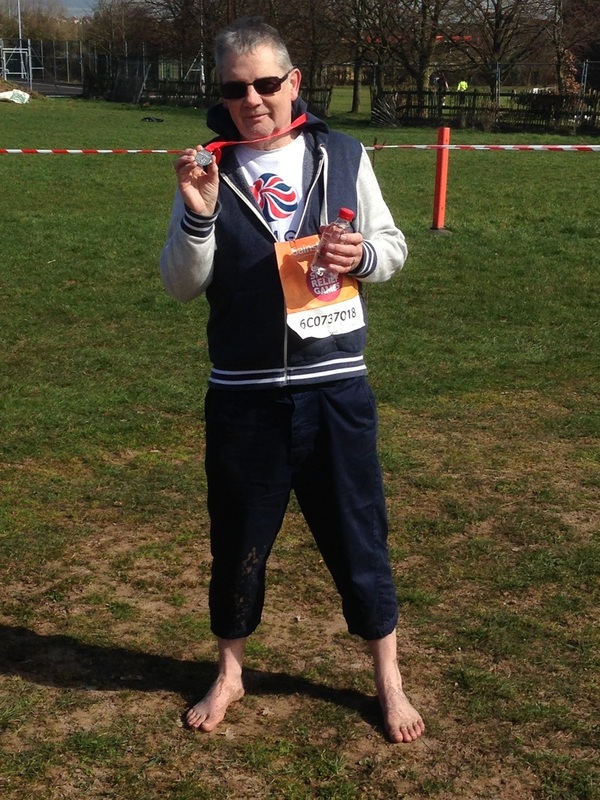 Read what is probably the most extraordinary interview Stewart Bint has ever given, right here. And this is a link to Hammy's home page. To celebrate Stewart Bint's 100th column in The Flyer magazine, a second compilation ebook of them has now been published. It's available...completely free...from the Smashwords website, and a number of online retailers. But you can get it, by simply clicking here: Up Close And Personal, Volume 2. It is available in all formats for any type of ereader. Volume 2 picks up where Volume 1 left off, October 2014, and takes us to the 100th column in The Flyer edition published on May 5th. Topics include cold calling, smoking, dreams, the supernatural, going barefoot, retirement, why we should abolish the letter 'e' in the English language, manners, children flying the nest, the author's involvement in charities, and supporting what you love instead of bashing what you hate. An extremely diverse range of subjects. Something for everyone. Originally appearing in Stewart Bint's Thunderlands short story collection, and subsequently published in an anthology by Plaisted Publishing House Ltd., of New Zealand, Stewart Bint's highly acclaimed short story The Twitter Bully has now been republished as a stand-alone edition, with all proceeds going to the UK Sepsis Trust. Stewart Bint explains why he has brought out this special edition of The Twitter Bully, and why he is donating all proceeds from it to the organisation that is fighting sepsis in the UK. "Readers of my blog on this website, and my magazine column, know that I'm passionate about raising the work of the UK Sepsis Trust in their fight against sepsis, which kills 44,000 people in the UK each year. That’s more than bowel cancer, breast cancer and prostate cancer put together. "Basically, sepsis arises when the body’s response to an infection goes wrong and injures its own tissues and organs. To save a life, early recognition and getting basic treatments such as antibiotics and fluids into the patient WITHIN THE FIRST HOUR, are vital. "Thanks to the incredible work of The UK Sepsis Trust and its supporters and volunteers, word is getting out there. Awareness is growing all the time. "Some of the symptoms to look out for: Slurred Speech; Extreme shivering or muscle pain; Passing no urine in a day; Severe breathlessness; Losing consciousness; Discoloured or mottled skin; Very high or low temperature; Racing heart beat; Rapid, shallow breathing. "It’s not just health professionals fighting sepsis. 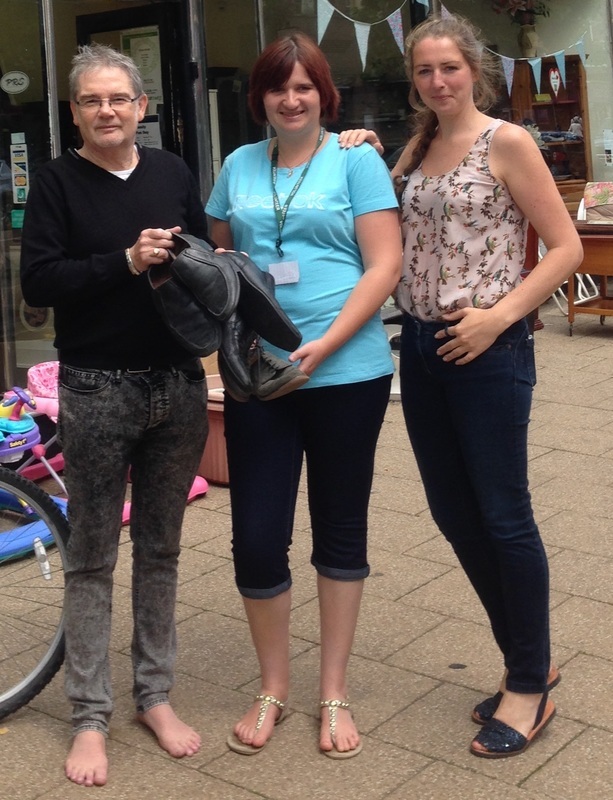 There are many ways that volunteers can help. 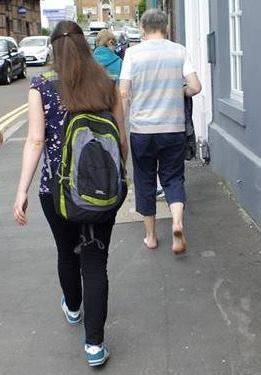 Personally, I promote sepsis awareness regularly to my 13,000 Twitter followers, and just before Christmas I delivered leaflets and symptom cards to my local primary school, medical centre, Bosworth College’s Desford campus, and, while walking round it seemed like hundreds of, households in my village. "So, please email info@sepsistrust.org and ask for some leaflets and cards. Or look at all the fund-raising and volunteering opportunities on their website: www.sepsistrust.org. "But above all, please, please, please, buy The Twitter Bully -- I'm told it's a cracking read, and you'll be raising funds for this extremely worthwhile cause. " Stewart Bint's latest novel, The Jigsaw And The Fan, was officially launched on October 15th. Available as a paperback and for all r-readers, it tells the satirical story of a dead trades unionist who can't get into Heaven or Hell because of a strike in the afterlife. Described by critics as "A freshly original and entertaining social satire," and "Sharp and well-paced wit keeps the reader entertained from the beginning to end...a well-intentioned but short-sighted adventure, the book is published by Dragon Moon Press, based in the city of Red Deer, Alberta, in Canada. Stewart Bint says: "The Jigsaw And The Fan was inspired by memories of reading the news on radio, and hosting current affairs and 'phone-in shows during the bitter miners' strike of 1984/85." The Jigsaw And The Fan - how much trouble can one disgruntled ghost really make? Albert Carter has died, and finds himself in the spirit world to get sorted out at St Christopher's gates. Having been a successful shop steward picketing the management of Jebson's Glue Factory on behalf of his colleagues, he feels confident his final destination is Heaven, with the rest of the decent, honest working class. However, on arrival at St. Christopher's Doomsday Ministry, an inspectors' strike causes all spirits in transit to be temporarily relocated to Earth until the dispute can be settled. Albert''s assignment is his worst nightmare: a wealthy Lord's manor which operates on the hard-earned wages of his own class. He immediately sets out to ruin the capitalist family, and begins his unlawful haunting as the Ghost of Marlston Manor. Stewart Bint's latest novel has now been published, and is available to purchase. But as the global launch party isn't until Saturday October 15, keep that news to yourself until then! We'd like to invite you all to the party -- it's being held on Facebook between 2 pm and 6 pm UK time. To join in the fun, simply click here: https://www.facebook.com/events/194820484286819/ and you'll be magically transported there. Now then....to be in with a chance of winning a signed copy of the paperback you need to join the party and answer the question that Stewart will be posting on the Event page between 2 and 2.30 pm (UK time -- don't forget that all times are UK BST) based on the photos shown below. 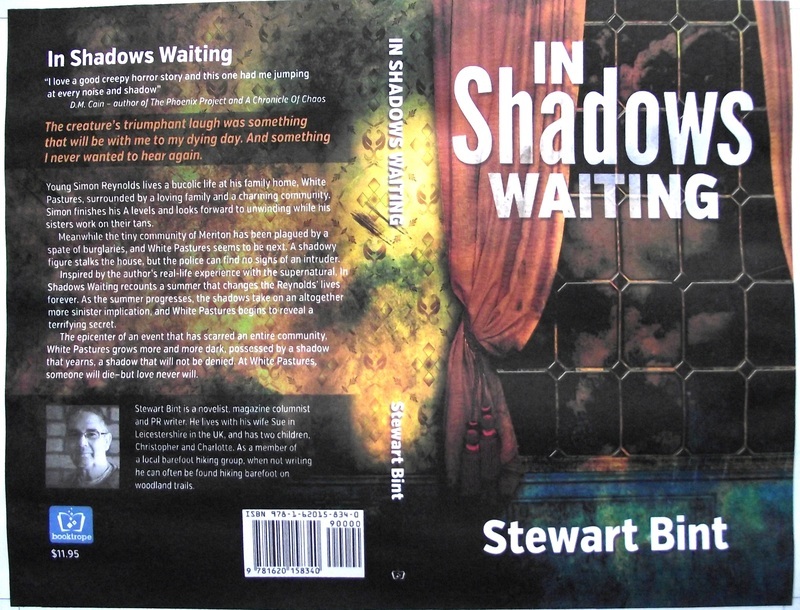 Stewart Bint's acclaimed paranormal tale, In Shadows Waiting, received a double nomination in the 2016 Summer Indie Book Awards, run by Metamorph Publishing. After a year of being with Booktrope, Stewart Bint has a new publisher, as of June 1st, 2016. Based in Alberta, Canada, Dragon Moon Press publishes novel-length genre fiction: fantasy, urban fantasy, science fiction, along with adult and YA-friendly adult fiction, in trade paperback and popular ebook formats. Dragon Moon Press was founded by owner Gwen Gades in 1993. Bint says: "I am honoured, proud and thrilled to have been signed by DMP, as they are a perfect fit for my books. Following the demise of Booktrope, DMP have the rights to my exiting novels Timeshaft and In Shadows Waiting, and I am working with them on a new edition of The Jigsaw And The Fan. "I am also hoping they will publish the novel I am currently working on for 2017, To Rise Again, along with a collection of short stories." 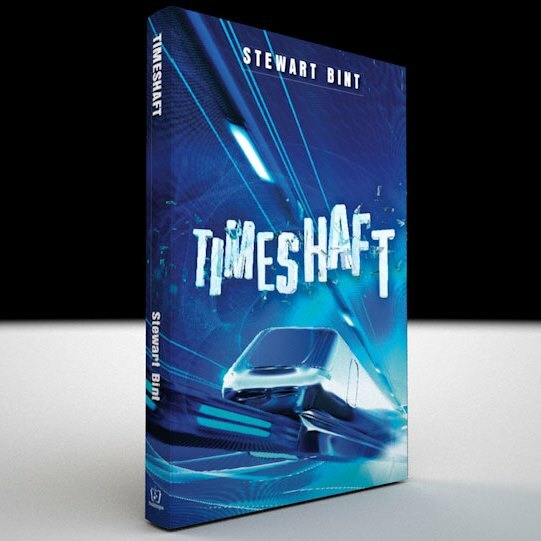 Stewart Bint's exciting time travel thriller, Timeshaft, was published on February 6th, and is now available as paperback and eformat, from Amazon and Barnes & Noble. Originally published by Smashwords in 2013, the new Booktrope edition includes a new beginning, new ending and a number of additional scenes, as well as a great new cover. So what is Timeshaft all about? 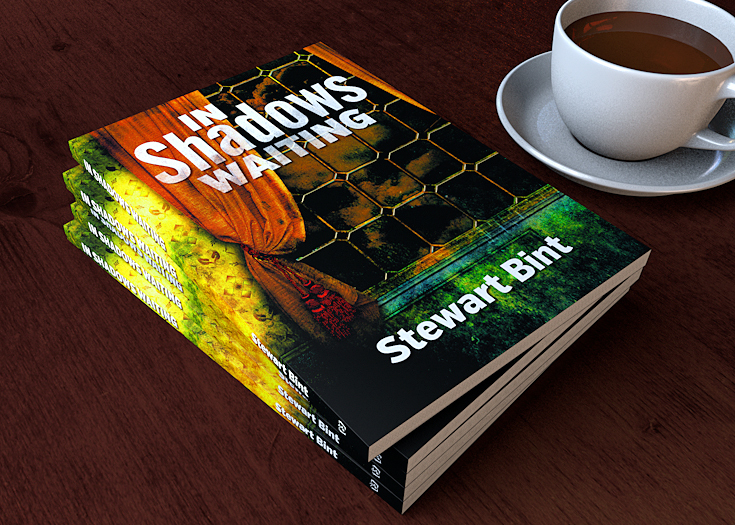 The new edition of Stewart Bint's In Shadows Waiting is now available as paperback and ebook. UK Amazon link: http://www.amazon.co.uk/Shadows-Waiting-Stewart-Bint/dp/1620158345/ref=sr_1_1?ie=UTF8&qid=1439655254&sr=8-1&keywords=in+shadows+waiting. Stewart Bint's novella, Ashday's Child, has achieved a top 10 merit in Inkitt's recent sci-fi competition. With the Booktrope edition of In Shadows Waiting due to be released in the next few weeks, Stewart Bint is proud to reveal the fantastic new cover. Stewart Bint's short story collection, Thunderlands, is the Summer Book Awards Winner in Book Of The Day's short story anthology section.